The Bluehead Fairy Wrasse is also known as the Ruby Head Fairy Wrasse, Yellow Flanked Fairy Wrasse, Purplehead Parrotfish, or the Blue Sided Fairy Wrasse. This species varies in color considerably ranging from a red and blue, to a deep maroon and deep blue. More often than not, this species will have a pale underside. This is one of the most exotic looking fish and can add grace to your aquarium. The variations in color and patterns of Bluehead Fairy Wrasse vary with the location of its natural habitat, and its mood. The Bluehead Fairy Wrasse is a saltwater species and is found in Indo Pacific regions. The Bluehead Fairy Wrasse is an ideal fish for the reef aquarium adding both bright color and activity. 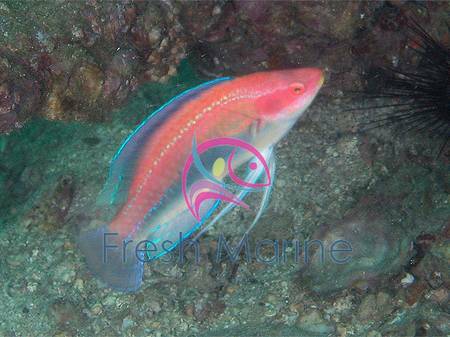 Wrasse of the genus Cirrhilabrus mix well together if they are introduced simultaneously to the tank, and are one of the best groups of fish for a reef aquarium setting. Bluehead Fairy Wrasse needs an aquarium of about 20 gallons with numerous places to swim and hide from its tank mates. Bluehead Fairy Wrasse likes to jump, so a tight fitting canopy in the tank is recommended. It needs a shaded area away from the bright lights. The Bluehead Fairy Wrasse generally gets along well with other small peaceful fishes and it should not be kept with aggressive tank mates. , Bluehead Fairy Wrasse is happiest in schools and is a bright addition to any peaceful system. Bluehead Fairy Wrasse will school with chromis and other schooling fish. It is advisable to feed the Bluehead Fairy Wrasse with a variety of vitamin enriched frozen shrimp, flaked foods, and other marine meaty foods. Minimum Tank Size: The Bluehead Fairy Wrasse prefers a tank of at least 20 gallons with plenty of places to hide and swim. Water Conditions: Keep water quality high (SG 1.020 - 1.025, pH 8.1 - 8.4, Temp. 72 - 78� F). Feeding and Diet: The Blue Head Fairy Wrasse is a carnivore and likes to eat variety of meats (fish, scallop, shrimp, squid, clam).